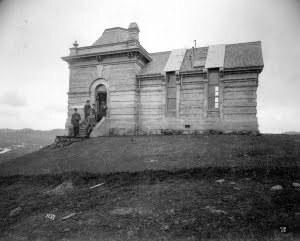 Similar to Villard Hall in its detailing, the observatory was built in 1889 atop Skinners Butte by local builder W. H. Abrams from a design by Portland Architect Warren H. Williams (Who also designed Villard Hall, the second building on the U of O campus). The Observatory cost the University $4782.78. Part of this coast was the $1,000 paid to Dr. T.W. Shelton who originally owned the property the observatory was built on. (A side note: Dr. Shelton at first did not want to sell but changed his mind in September 1888. Perhaps as he needed funds to rebuild his not yet completed mansion on the south side of the Butte after it had been burned nearly to the ground by a disgruntled worker.) Subject to vandalism and handicapped by its distance from the University, the building was abandoned by June 1898. In the early morning hours of May 12, 1905, the Observatory was covertly demolished with several charges of dynamite as it had become a serious liability to the University. If you walk to the view point at the east end of the parking lot atop the butte you can still the foundation of the structure. has anybody ever searched with a metal detector to find artifacts in the area?